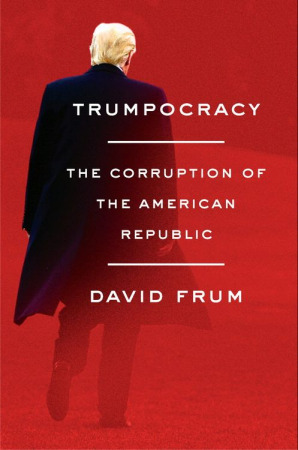 Brooklyn Digest: Books: The Threat To Democracy From "Trumpocracy"
Frum served as a special assistant and speechwriter for President George W. Bush. He is an alumnus of right-of-center media and think tanks, and has advised conservative leaders in this country, as well as the United Kingdom and his native Canada. Trumpocracy is a very comprehensive work, starting with the conditions that made a Trump run possible and how he is using his power as president and how institutions are failing to check it. Frum goes back to a more civil time in American politics, 1992, and quotes George H.W. Bush's concession speech to Bill Clinton, in which he said, "Now I ask we stand behind our new President and regardless of our differences, all Americans share the same purpose: to make this, the world's greatest nation, more safe and more secure and to guarantee every American a shot at the American dream." In response to this, Frum writes, "In the years since 1992, however, the game of politics has evolved more and more into a live-fire exercise. The end of the Cold War perhaps explains the intensifying ferocity of the competition: since 1990, national security concerns have mattered less to American elites. The slowdown in economic growth since the year 2000 and he shock of the financial crisis and the Great Recession have embittered politics too; when there seems less to go around, people quarrel more ferociously over what remains. Ill feeling over the Supreme Court decision that elevated George W. Bush to the presidency over Al Gore has never healed. Accelerating ethic and cultural diversity raises the stakes while aggravating mistrust and resentment between Americans." All of the points he raises there were the things Trump exploited to win in 2016, especially economic issues and changing demographics in the country. Frum writes, "Trump gained the presidency thanks in great part to voters disgusted by a status quo that was ceasing to work for more and more of them. The largest and most loyal subset of those voters were men who felt devalued in the economy and disrespected in the culture, who chafed at being scolded for their 'privilege' even as they succumbed to disability, drugs, and early death. "Trump has not kept faith with these voters. But they have kept faith with him. For fear of them, Trump's party stays bolted to him. Members of his party may denounce him in 'on background' interviews. his own staff will leak their disgust at his antics and cruelties. Yet whatever these powerful people say in private, they continue to enable him in public. It is their public actions, despite their private qualms, that sustain Trumpocracy." Trump only sought the presidency for the power and glory it would provide him and turns some of Trump's gripes about "fake news" on its head, Frum contends. He writes, "President Trump has plunged the government of the United States into chaos that enhances his personal power. He has persuaded millions of Americans to ignore information they need as 'fake news' from a 'corrupt media.' He has allowed foreign states and local politicians to tamper with the integrity of American elections to his own benefit. He demands that high officials disregard the law in favor of personal loyalty to him. He has concentrated power in the hands of military men - better men than himself, but not the right hands for the job of civilian government. He has alienated allies, appeased large enemies, and goaded small ones to the edge of war. He has brutally inflamed the ethnic and class divisions that empowered him in the first place. He has enriched himself in government in a way that disheartens every honest public official, and invites dishonest ones to imitate him. "But that cannot be the final word - and it will not be. We can choose our futures, not merely submit to them. Past generations of Americans have faced and overcome severer tests. Will this generation be found wanting in its hour on the stage of history? Someday, the time will come to write the history of that hour. I undertake this book before that time, as my contribution to ensuring that the hour's ending is one to be prouder of than its sorry opening." Frum acknowledges the timing of a book like this, in essence a call to arms about what he perceives as a threat to democracy, was an issue. "If it's potentially embarrassing to speak too soon, it can also be dangerous to wait too long," Frum writes. "I sometimes wonder what would have happened if some forward-thinking member of Congress had devoted his or her career in the late 1990s to fighting for the hardening of airline cockpits against hijackers...and might have prevailed just in time to prevent the September 11, 2001, attacks from taking the form they did." Between 1975 and 2000, the world turned toward democracy. Since that time, dictatorial regimes have cropped up all over the world. Frum writes of that and its relation to the United States, "From Russia to South Africa, from Turkey to the Philippines, from Venezuela to Hungary, authoritarian leaders have smashed restraints on their power. Media freedom and judicial independence have eroded. The right to vote remains, but the right to have one's vote counted fairly may not. "Until the US presidential election of 2016, the global decline of democracy seemed a concern for other peoples in other lands; a matter for US foreign policy, yes, but not for America's internal affairs. That complacent optimism has been upended by the political rise of Donald Trump. "The crisis is upon Americans, here and now."